Monday was our first workshop day and I came in with the idea of making a spinning wheel that moves through the water by using a motor and a weight that will make the wheel tumble (because the weight will move forward and thus push down that particular part of the wheel). I had no clear idea what the wheel would be made of, but brought some rubber foam things to make the object actually float. Bonus idea was to attach some steel tea filter to make this an algae harvesting machine. When I discussed this with Tim, we came to the conclusion that the weight of the motor will probably already be heavy enough to function as said weight. I started by making a cross-shaped steel construction to fit in the wheel (that I thought at that point to be a plastic strip that the rubber pieces would be stuck onto). 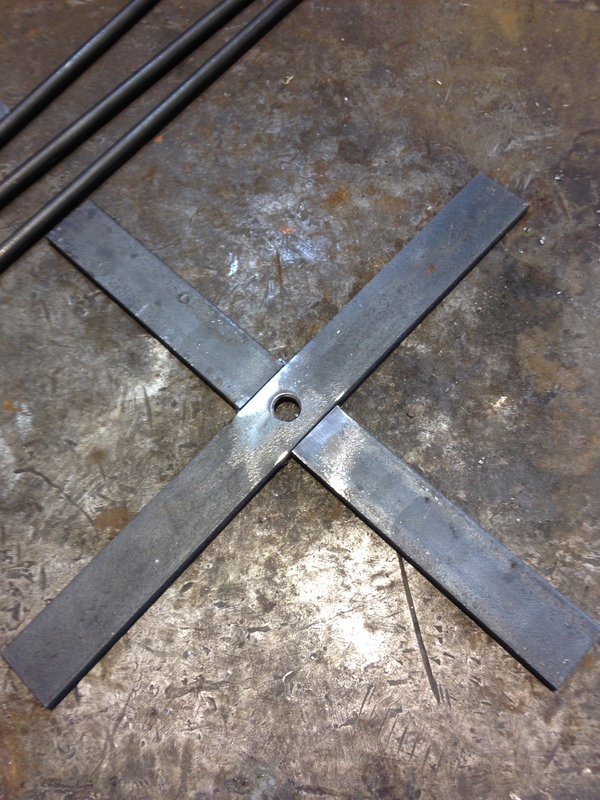 Along that process, I learned how to cut and drill steel and I welded for the first time in my life (and loved it)! While looking at the steel cross that the motor could be screwed onto, I noticed that it was too small to keep the motor out of the water. 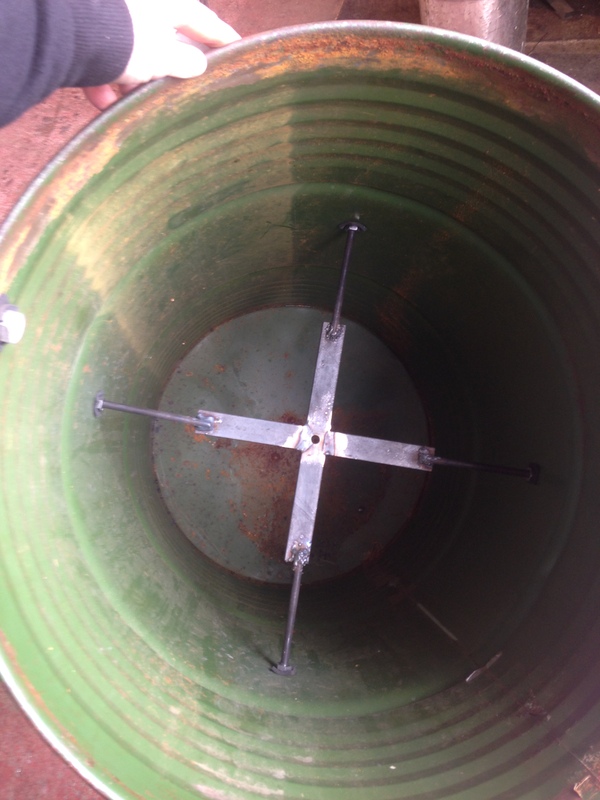 Tim came to the rescue with the idea of extending the four steel strips to fit in a iron barrel usually used for oil. 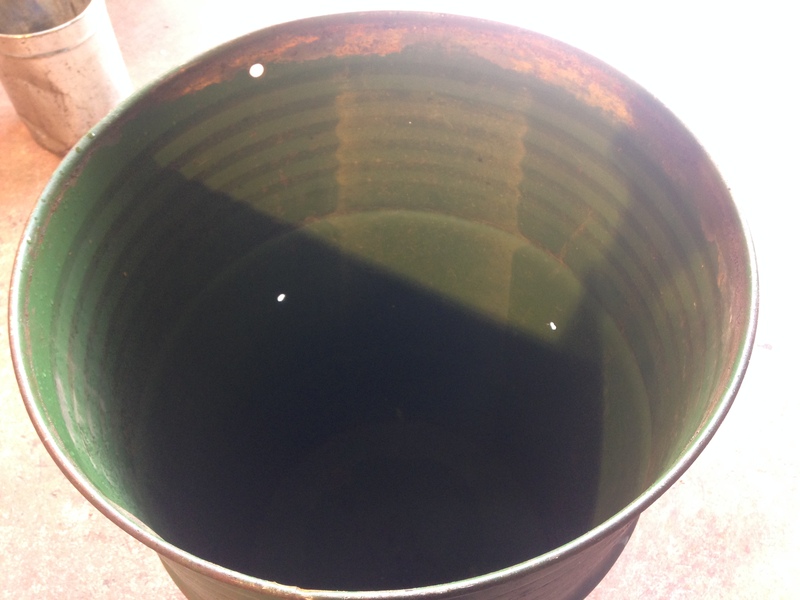 I ended the day by measuring the barrel, and cutting four pieces of round steel to weld onto the existing cross ends, and to bend and weld to the inside (and exact middle) of the oil barrel. 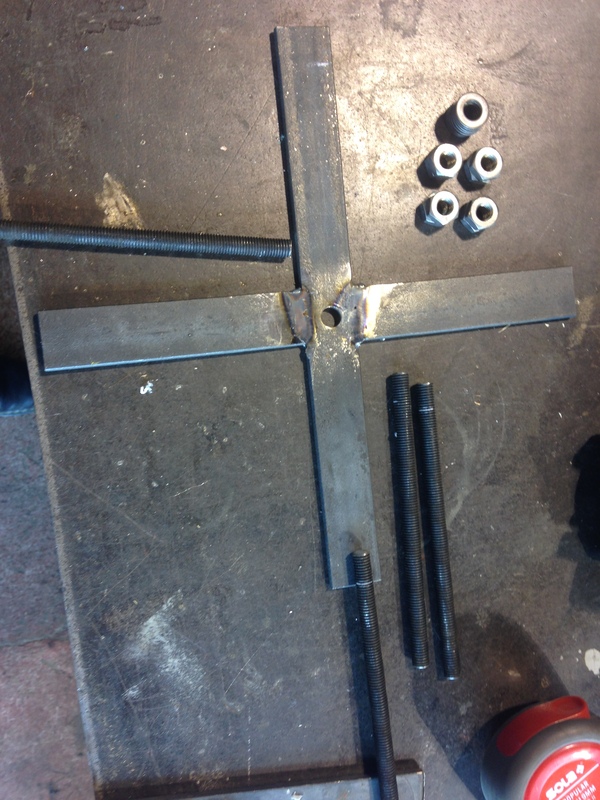 Thus on Wednesday, the welding of the cross extensions and into the barrel will be my first steps. The cables of the motors will go through the whole that the barrel has on top, and when this is exactly balanced it will be time to try out 1) if it actually floats and 2) if it tumbles around its axis as hoped. Day 2 of metalworking! As we were cooking that day, we sadly only continued with our projects in the afternoon. 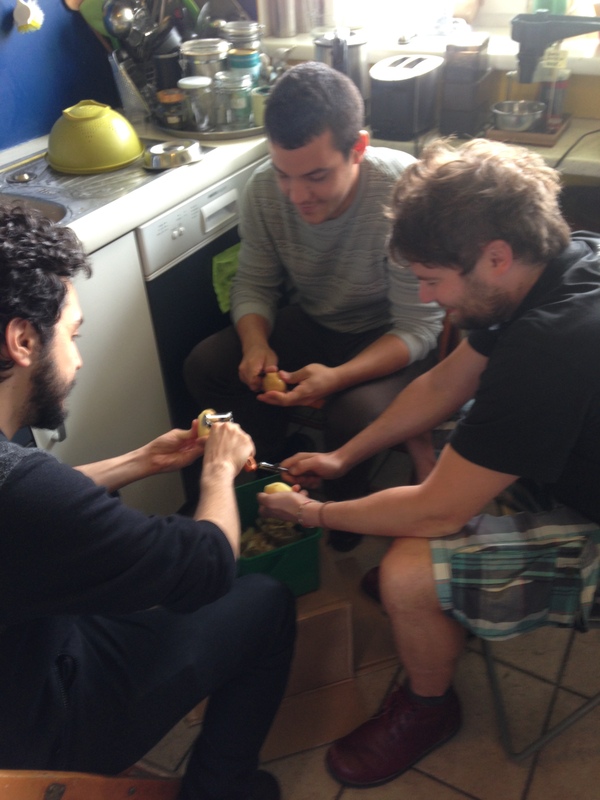 But how often do you see three guys peeling potatoes? This totally made up for the lost time. After the lunch duties, I started with bending my 4 steel pieces, already being a bit worried about welding them to the barrel INSIDE the barrel. Luckily, Mark was also afraid (in his case, afraid of damaging the barrel in the welding process, as the walls are extremely thin) and suggested another method: drill 4 holes in the walls and use longer threads to go through, secured by nuts and rubber to make it watertight. Because it was already quite late, I didn’t get to actually put this all together, but I was halfway through by the end of the day, having a barrel with four holes and very exact measurements for fitting in the cross because balance is key in this project. 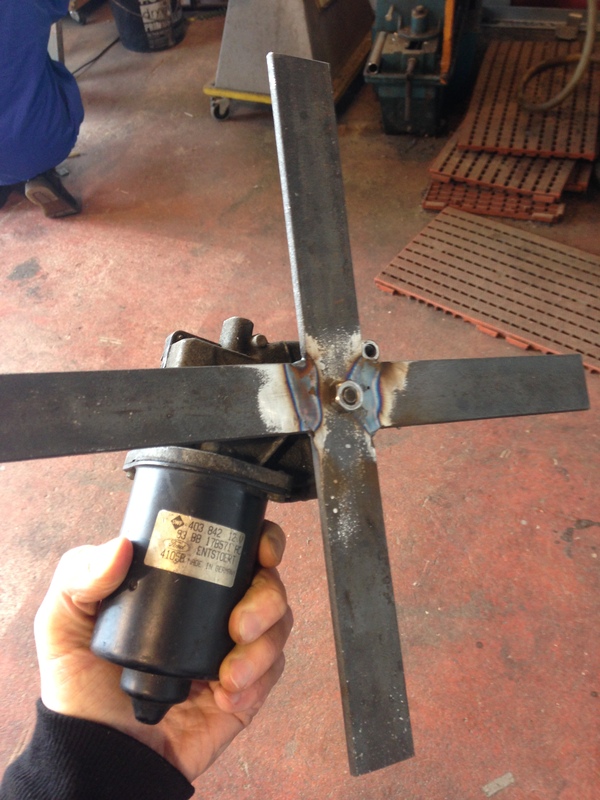 Welding was almost a habit by day 3, so I fit in the steel cross and welded the ends of the threads to it so my cross was secured inside the barrel, attached to it the motor. I attached wires to the motors (and learned crimping in the process), and also added a rope for security, to be able to get back my barrel IN CASE it might sink. After some ‘dry tests’ on land, and almost letting the barrel go on its ‘maiden trip’ without the lid (in which case I would have been happy to have the rope, and unhappy because of the electric shock I probably would’ve gotten), it was time to get this drum in the water! Because of external factors, it was hard to evaluate if it passed the first water test, but it was clear that the tumbling did worked, but wasn’t very powerful. Thus, next action? Adding more weight. I welded some pieces to each other and cable-tied this to the heavy part of the motor. And this did it, the final check worked perfectly, and the barrel was spinning like a charm. To prevent the cable from getting all tangled up, I added a switch so the motor could rotate in both ways, and learning quite something about wiring motors along the way. Unfortunately, I didn’t have the time to even think about adding the filters to harvest some algae but it would have been perfectly possible in theory, which kept me satisfied. …it didn’t work because a contact of the switch came loose. I fixed it again, and did another post-presentation showcase on the land – which actually even worked better than on the water. The barrel was moving because of the screws that stuck out on the sides and acting as resistance ‘feet’. On the water, it would spin, but never actually tumble as initially planned. So in the end I made a crawling barrel! 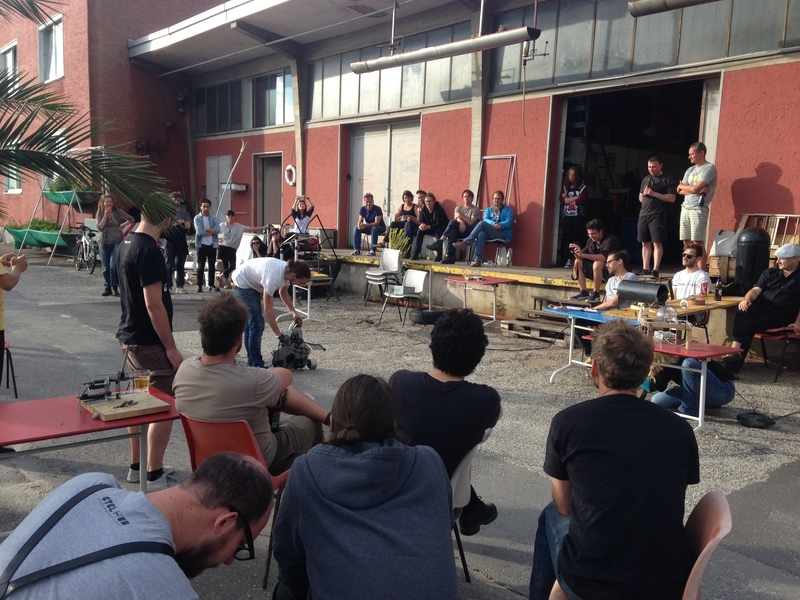 This entry was posted in Uncategorized and tagged barrel, kinetic, motors, Robotics2015, switch, water. Bookmark the permalink.